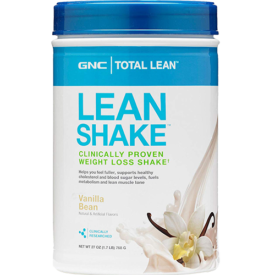 Home » GNC Total Lean Shake Review – Pretty Nutritious, But What About the Taste? 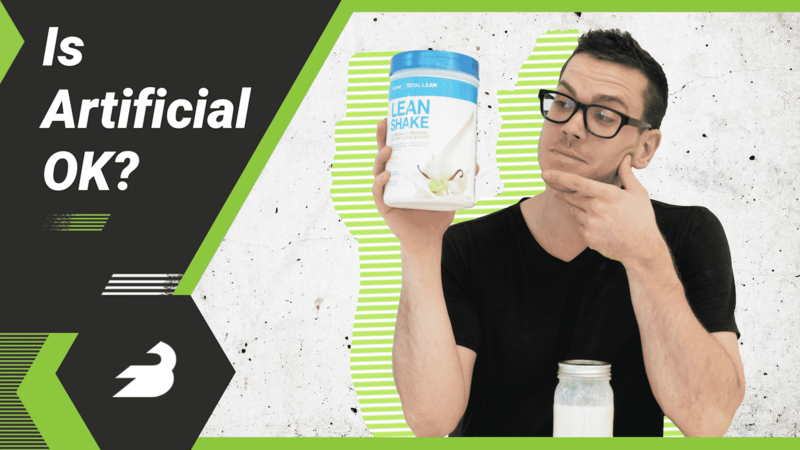 GNC Total Lean Shake Review – Pretty Nutritious, But What About the Taste? GNC is an enormously popular chain of supplement stores that has thousands of locations in the United States and stores in fifty other countries around the world. Because they own their own stores and factories, their products are known for being pretty inexpensive and crowd pleasing. We’ve tried many of their products ourselves, including their whey protein, BCAAs, and their creatine. Their meal replacement sold under their Total Lean line, called “Lean Shake,” is a pretty interesting supplement. 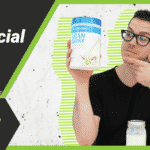 For starters, it’s described on the front as “Clinically Proven Weight Loss Shake,” which is surprising because a lot of supplements try to avoid explicitly stating their product can help you lose weight. 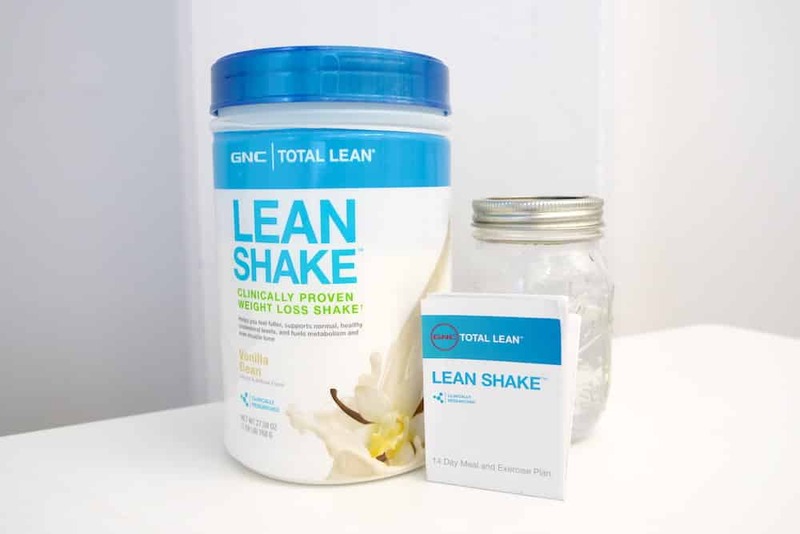 GNC, however, is very confident in its ability, pointing to a randomized study that saw more weight loss among people using their lean shake — and the 1500-calorie meal plan and exercise routine that comes taped to the tub — than among people who just followed a 1500-calorie diet. It seems pretty obvious that exercise was an important component of that difference but nonetheless, I liked that this product comes with a detailed exercise and diet guide. So what’s the nutrition like? A nutritious, low calorie shake that's especially focused on weight loss. One serving is two scoops and contains 180 calories: 9 grams of protein, 32 grams of carbohydrates (3 grams of fiber, 4 grams of sugar), and 2 grams of fat. There’s a pretty great variety of micronutrients as well, with roughly 30 percent of the recommended daily intake of most vitamins and minerals, including Vitamins A, C, and E, magnesium, zinc, selenium, copper, and chromium. The only nutrients it’s low in are Vitamin D, Vitamin K, potassium, and manganese. Most of the ingredients are just the vitamins and minerals themselves, but it’s worth pointing out that the carbs come mostly from maltodextrin, there are three kinds of gum in here, there’s quite a bit of corn (starch and syrup solids), there’s soy lecithin for mixability, and it contains artificial flavors and sweeteners like sucralose and acesulfame potassium. There’s a pretty solid amount of nutrition in this product, again there’s about 30 percent of the RDI of most nutrients. I was a little bummed out about the lack of Vitamins D and K, potassium, and manganese, but it’s nonetheless pretty low in sodium (5%) and cholesterol (2%), two nutrients that a lot of people try to minimize when losing weight. We think GNC is the best meal replacement for athletes — see who else made the list! So I liked the micronutrients, generally speaking, although I wasn’t quite so happy with the macronutrients, since there’s just 9 grams of protein per serving. Protein is an important component of satiety and weight loss and I think 32 grams of carbs per serving, 2 grams of fat, and 3 grams of fiber sort of missed the mark, although it is pretty low in sugar with 4 grams per serving. The other thing I can see some people taking issue with is the ingredients: milk, soy, corn, and artificial ingredients. I’m not saying they’re necessarily bad for you — not at all — but there are nonetheless people who try to steer clear of some or all of those in their supplements. This isn’t Paleo, in other words. You can pick up a 1.7-pound tub, which contains 16 servings, for $35. That comes to $2.20 per serving, which is a pretty reasonable price for a meal replacement (most are between $2 and $2.50). That said, for a GNC product that’s full of artificial ingredients, I was expecting this to be cheaper. I grabbed the Vanilla Bean flavor which is very, very sweet. 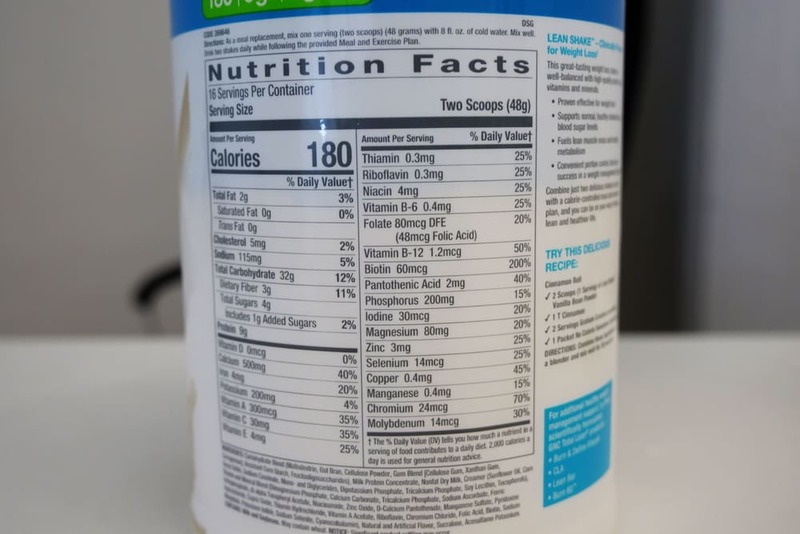 The directions say to mix two scoops with 8 ounces of water, and one obvious way to improve the sweetness would be to simply mix it with twice as much water, which I recommend. That said, it’s still a very artificial flavor that some people might not love. Here’s a 180-calorie shake that delivers plenty of nutrients, though not much fiber or protein. I think that GNC could have made this more filling if they want people to use it for weight loss, but as a means of delivering vitamins and minerals without a lot of calories, I think it’s effective.